Nathaniel has had another great idea for an educational program and he makes it helpful to others with carefully designed output while improving his own command of advanced language features. 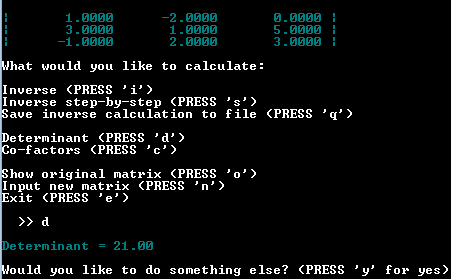 This screenshot shows the menu and a matrix used for testing. We recommend Option s to see the working as in these screenshots. This screenshot shows the program running on a Raspberry Pi. The terminology can be confusing. 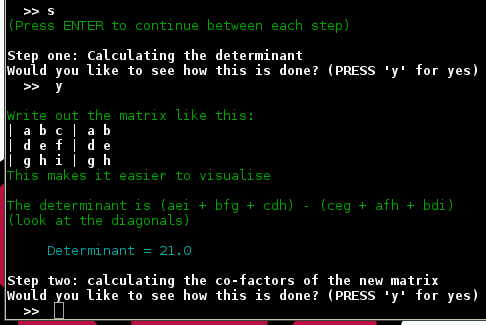 Nathaniel refers to the cofactors before multiplication by the sign matrix as cofactor elements rather than the term minor used by Vitutor. 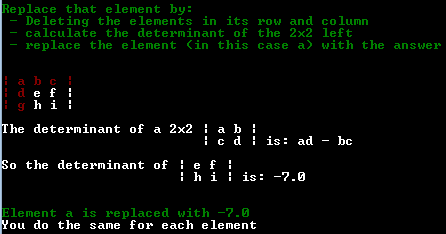 For Option c to show the cofactors we added a line of code to call the procedure to apply the sign changes so that the program now gives the same result as WolframAlpha. You can download the Pascal Source (instead of copying it from the page) and/or the executable MatrixInverter.exe for a PC.